This is specially designed for low cast and easy storage of gold coin and silver coins. - Size: 3.5 x 3.5 x 3.5" / 9 x 9 x 9cm. 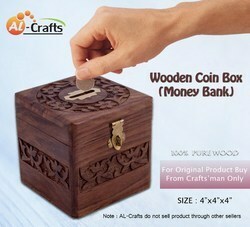 We hold proficiency in presenting a wide series of Wooden Money Bank. These products are developed as per industry standards employing the premium-grade basic material and sophisticated technique. Our product is extensively employed owing to sturdy nature and longer life. Moreover, we present this product at nominal prices. - We collect the raw material from highly trusted organization and providing a good quality of leather "Coin Saving Box", that is highly durable, cheapest, unique & enough space to use. - Made up by high quality of leather. - Available in multiple designs and colours. 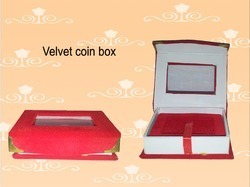 In order to retain remarkable position in this industry, we are providing a wide array of Coin Box.